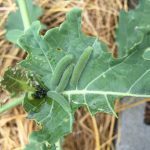 I have black and white caterpillars on my broccoli plants. What is the best way of getting rid of them? Prevention is key with regular checks of the undersides of leaves, especially during spring and summer. Simply pick off any eggs and dispose of them, along with any caterpillars, which you can either relocate or squash. They can also be dropped into a small bucket of water and drowned. Beneficial predator insects are another option for control. 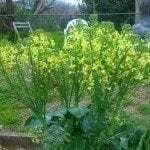 Some quick and easy homemade repellents to keep caterpillars from eating your plants include solutions of water with one of the following plants added: onion, garlic, chives, hot pepper (jalapeno, cayenne), or an herb (basil, coriander, wormwood, peppermint). Steep the leaves in hot water or mix in a blender and strain before spraying. These sprays will successfully repel a wide range of insects. Bt and neem oil are also effective solutions for taking care of caterpillars.